This letter was written by William Byrns (1838-1875) of Burr Oak, Michigan, who enlisted at age 22 in Company B, 1st Michigan Infantry in April 1861. He enlisted as a fifer, was promoted to 2nd Lieutenant in August 1861, to 1st Lieutenant in April 1862, and to Captain in September 1862. This letter was written by William Byrns to his future wife, Florence Clark (1842-1927), the daughter of Albert Burr Clark (1817-1882) and Laura Spencer Adams (1818-1877) of Galesburg, Knox County, Illinois. After resigning his commission, Capt. Byrns attended the Department of Medicine & Surgery at the University of Michigan and became a medical doctor. He practiced in Galesburg, Illinois. 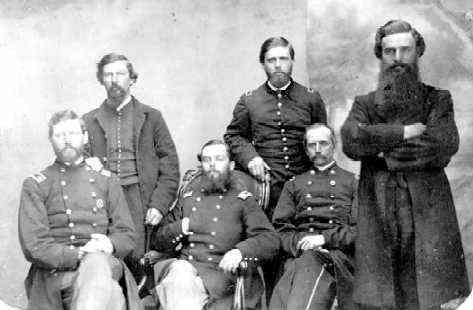 There are numerous letters by William Byrns written during the Civil War published in the Michigan Civil War Collection website kindly shared by Tom & Rutger Breakey. May I write “just when I feel inclined?” I feel so tonight & indeed, if I did not write immediately after reviewing so good a letter as your last — the first written after arriving at Mt. Morris — I would be guilty of conduct unbecoming an officer & a gentleman & would deserve trial by court martial for violating the 83rd Article of War. We have been under marching orders for several days & have been “almost sure” that each night would be the last one spent in our present camp. Just before I began writing I saw our Colonel — not our old Colonel, he is Brig. Gen. now — but my own favorite “little Horace S” as he is called. For some reason he is “favorably inclined” toward me & I do not stand in awe of him a bit. “As I was trying to tell you,” I have just seen Col. Roberts & he has told me that we are to move at sunrise tomorrow. We feel that there is yet work to be done on the Eastern peninsula & that now the time has arrived. I do not think we will go far as we take but two days rations & “go light.” All of Gen. [John Ellis] Wool’s command at the Fortress are now embarked on transports. Probably they will be thrown across under cover of the night & we will cross above our present position early. This is only an opinion, however. I will write you very often — that is, of we are so situated as to send letters. I am so happy to know that you have so good & kind & noble an Uncle as C. B. [Adams]. I am not in the least jealous that you give him your full confidence. I feel resigned to the idea of your not going home the present month. As to my leaving now, I will let you form an opinion from an incident/ This A.M., I wanted to go to Old Point & see Capt. [Ira C.] Abbott. He is still sick there. So I went to Col. Roberts & touching my cap in most graceful manner asked to be excused from the A.M. drill in order to go to Old Point & see my Capt. “You can be excused [from] the drill but must not leave camp for if we should move, you must be with “B” Company. So it is. Although not senior officer in the Company, I am depended upon — all of which I don’t like — but I suppose my Col. knows what is best for me. I do hope that matters will be cleared in this department before many days so that one can tell what to depend upon from one day to another. I greatly fear that Uncle C. B. [Adams] will have to accompany you home, as much as I envy him the trip. Time alone can tell what will be our “future state” in military matters. I have not heard from Charly Parsons in a long time. How anxious his Jenny must feel knowing that his regiment is in the field. But I have great hopes that McClellan’s army will not have the fighting to do that they anticipated. Do you often think of your William? I am sure that you cannot oftener than I do of the fair haired lassie that’s looking, waiting, & praying for her soldier boy. Verily, if all the Generals & “heads of the departments” were placed as we are & had the same object in view — viz: quick work & a safe return home, this war would be pushed faster than tis. I am gratified to know that your Uncle has a favorable opinion of me. I am sure he did not see me long enough to become acquainted with me. I admire him & think him a true gentleman. As to your going home without him, unless you are more accustomed to traveling than I suppose you to be, I would not advise you to go. I know that your people want you to come home, but they can live without you, if it is for your interest to stay. They need not hurry. Take the advice of your parents & Uncle — they know best. I often try to think how you look & talk. I am certain that you have changed greatly since I saw you — not in feelings, but in appearance. Are you not a great deal better, entirely well? Tell me, you know just how anxious I am. You are all I have to work for, all I have to love. My sole incentive to do my duty better than well, & all that interests you does me. I am sure you love me better every day — not that I deserve it — & that I have indeed a prize worth working for. “I want to see you,” you write. Thank you, but you cannot want to more than I do, for you have dear good friends at hand — those in whom you place confidence. I have none, for in the army every man is a sealed book. The duties of the hour generally occupy all the time & only when the paper is spread do we give ourselves to our own feelings. I go to my rest safe in assurance of your love. No doubts can come & no mistrust intrude. I go to my couch tonight & lay down in peace to dream of you, to wake, & march we know not where, perhaps to the battlefield. And should it please God to take me away there, may His grace enable me to meet in heaven my own loved darling Florence. But “in God is my trust” & he will protect.